The occasional insight presented in a mini-article. When I teach solution architecture classes, technical debt is always a very popular topic among practicing architects. Technical debt is a metaphor that transposes the concepts of loan and interest to IT based solutions. It respresents work that should be done in order to deliver a consistent, maintainable solution. As long as the work has not been done, the solution is in debt, which means that some stakeholders pay interest in the form of e.g. extra effort needed for simple changes, or higher support fees. Repaying the loan’s principal means doing the work needed to remove the debt: this could mean e.g refactoring software or upgrading hardware. As soon as that work has been done, the stakeholders stop paying the interest, just like when a loan has been repayed. The technical debt metaphor has been very popular in the software development world, where it refers mainly to low code quality or unnecesary complexity. Tools like SONAR now have functionality that analyses source code to measure such “implementation debt”. For architects, however, other types of technical debt may be more interesting. Aside from implementation debt, there is “architectural debt”: this is typically structural in nature, or represents a technology gap. 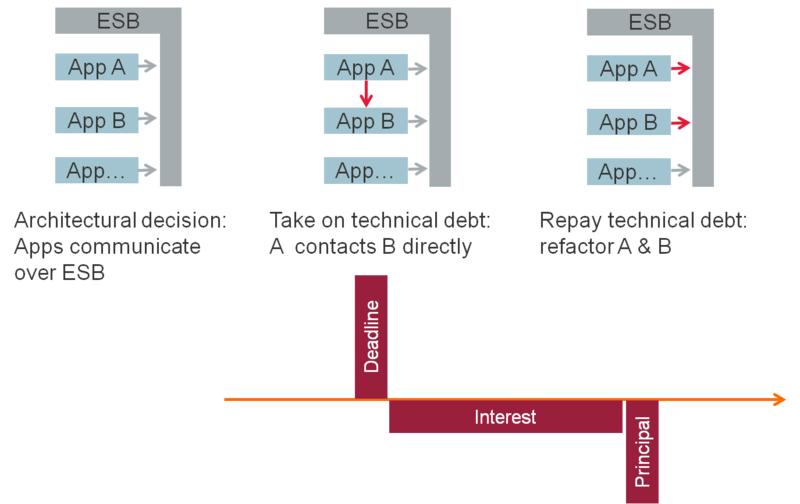 An example of structural architectural debt is when an architectural principle like “all applications should use the Enterprise Service Bus (ESB) to exchange data” is temporarily violated. An architect could decide to allow direct access from application A to application B’s database if A needs data of B that have not yet been exposed through the ESB, and doing it properly would mean missing an important deadline. The interest in this case is caused by reduction of control of the information flow through the application landscape, and potential errors being introduced by teams that are not aware of the shortcut. The principal is the refactoring that needs to be done later on: changing applications A and B to route the data through the ESB, and configuring the ESB. This type of debt cannot be measured in the software code of either application: it is structural in nature. The same is true of technology debt, when a solution uses obsolete hard- or software products that cause potential failures and risks (interest) and needs to be upgraded (principal). One of the problems many architects face is convincing their stakeholders to reduce technical debt, mainly because the debt is invisible to the end-user (see Philippe Kruchten’s categorization). Making the case for technical debt reduction in technical terms will usually not convince the business stakeholders. That requires translation into economic terms – in other words, a business case. If one has unlimited resources (time, budget, staff), the business case for repaying technical debt is quite simple: the longer you wait, the more interest you pay, so the economic optimum is immediate repayment. The only exception is when the solution is planned to be decommissioned, and the total interest to be paid over the remaining lifespan is lower than the cost of repayment. Usually, however, resources are limited and the business case for technical debt reduction needs to compete with other solution improvements, such as new features. In all cases, proper representation of the interest is crucial to making a compelling case. In case of structural or technology debt, it is often hard to quantify the extra costs caused by the debt. The difficulty is compounded by the inherent uncertainty: things might go wrong, but they might also go smoothly, even with the technical debt present. One often hears arguments like “we’ve run this application on this platform for 15 years, and it has never caused us any problems – so why invest in an upgrade?”. The key to making the business case for technical debt reduction is to account for the risk caused by the debt. The proper way to calculate the total expected cost of uncertain failure is the well-known risk exposure formula: E(S) = p(S) x C(S), where p(S) is the probability of failure scenario S occurring, and C(S) is the cost incurred when S occurs. By summing up the risk exposure E over all possible failure scenarios S caused by the technical debt, you come as close as statistically possible to an accurate prediction of the expected cost of failure. I recently encountered a situation where a large transportation company was running some of their core business systems on ancient mini-computers. Spare parts were very hard to get by, and the manufacturer had put severe limitations on their maintenance contract. The organization in question had a hard time making the business case for migrating the system to a modern, virtualized, blade-based solution: the cost of the old platforms was so low that the ROI for the migration looked negative. The risk of failure, however, was substantial: a single missing spare part could potentially break the company by disabling their core system for a few days. Including that risk exposure in the technical debt interest leads to a completely different business case. Forgetting the risk factor in the business case for technical debt reduction is a common mistake, which can lead to very wrong decisions. The organization in the example above instinctively knew they had to make the upgrade anyway, but the omission of the risk in the business case did lead to unnecesary delays in the decision making process. In short: architects arguing for technical debt reduction should make sure that they articulate the risk component in the interest. This will help them convince stakeholders to give proper priority to things they might otherwise find less interesting for being invisible to end-users. This entry was posted in Idea on 27 January 2014 by admin. In our architecture classes, we always spend some time discussing the difference between architecture and design. We say that architecture is a set of design decisions, so is there even a difference? In some domains, there really isn’t. In our organization, infrastructure architects generally take all infrastructure design decisions, and are responsible for the completeness of the design they deliver. Software architects sometimes leave detailed design to developers. Solution architects’ projects often encompass multiple technologies and domains, for which they cannot be expected to have mastered all the technology-specific skills to complete the detailed design work. Looking at architecture as a risk and cost management discipline (as RCDA does), the architect should focus on those design decisions that have the highest impact on the risk and cost associated with the solution. The first of these is based on how we have seen typical architects and designers deal with uncertainty. When running into an item that has not been decided yet or is otherwise uncertain, successful designers usually put that item on the back-burner. They ask someone (a manager or architect) to resolve the issue, and then quickly move on to analyze the next use case or service item to keep up their productivity. Architects cannot afford to do that. Successful architects actively search for uncertainty, since uncertainty generally is associated with concerns with high impact on risk and cost, that need to be addressed as soon as possible. The second additional contrast is Conceptual integrity versus Completeness. It pertains to the reason behind having two different roles for architecture and design. What is the main benefit of this role separation? When would you want to put one of the designers of a solution in a different role from the others, and call him architect? This only makes sense if it is too much work for one person to design the complete solution. If you need two or more persons to design a complete solution, it makes sense to appoint one of them to preserve the conceptual integrity across the whole solution. This person we call the architect, and the other designer(s) should make sure that the solution design is complete. Looking at it that way, the distinction between architecture and design is a separation of concerns. The concerns of conceptual integrity on the one hand and completeness on the other hand need to be separated, because they would otherwise compete for the scarce resource of human attention, at the expense of either one or the other. So if you are wondering whether your skills are better employed as an architect or as a designer, ask yourself this question: how do you like to deal with uncertainty? At the end of the day, do you get more satisfaction out of a) delivering a nicely rounded, complete design, or b) chasing down unresolved issues and making suboptimal decisions based on incomplete information? If your answer is a), you are probably better off as a designer than as an architect. This entry was posted in Idea on 16 November 2013 by admin. Architecture can be agile, too! Ever since the introduction of “Agile” around the turn of the century, people have wondered how to combine agility with architecture. The difficulty of this combination is due in part to a fundamental difference in goals between the agile and architecture approaches: architects look for stability and future-proof-ness, while agilists want to embrace change, looking for a kind of future-“loose”-ness. Some say architecture and agility are conflicting approaches. The agile proponents’ attitude towards Big Up-Front Design (BUFD) certainly seems to directly oppose the idea of architecture-driven development. This perception of conflict is increased by the agile movements’ tendency to behave like a religion, complete with dogmas and heretics, as wittily described by Philippe Kruchten. On blogs, agilists sometimes post rants against any suggestion towards up-front thinking about a solution’s architecture, or any hint that not all key (quality) requirements can be addressed afterwards by magically refactoring an IT solution. Fortunately, not all agilists scorn architecture, as witnessed by Scott Ambler’s essay on agile architecture. Looking more closely, one sees that architecture and agility represent two ends on a spectrum. Where in this spectrum is the optimal place for your project to live depends on the project context. As noted in an earlier blog post, Barry Boehm suggests that the ideal place on this spectrum depends on three factors that together determine the amount of architecture needed beforehand: the size of the project, the volatility of the environment and the business criticality of the solution. Agilists can become more successful if they take the project context into account when assessing the usefulness of architecture, but what can architects do to cross the divide between agility and architecture? Judging by TOGAF, the Open Group’s popular architecture framework, the principles in the Agile Manifesto have long been neglected by the architecture community. ADM, the TOGAF architecture development method, still requires rather bulky documentation, produced by often heavy processes like Business Architecture, Information Systems Architecture and Technology Architecture. This type of enterprise architecture approach is not suitable for an agile environment. In the software architecture world, lighter architecture approaches like George Fairbanks’s “Just Enough Architecture” are gradually gaining ground. These more agile approaches no longer view architecting as mainly a design discipline, but also as a way to control risk and deal with uncertainty. Risk- and Cost Driven Architecture (RCDA) is a relatively new approach in this arena. This approach was developed to close the gap between enterprise and software architecture. Existing software architecture practices are often too limited in scope for the solutions that need to be architected, but the enterprise architecture practices are too heavy for the agility required by time pressure and frequently occurring changes and uncertainty. The RCDA approach incorporates a number of aspects from agile software development practices, such as the use of a backlog of architectural concerns, to be frequently reprioritized based on economic factors like risk and cost. The secret of making architecting agile is to change your view of the main deliverable of the work, just like with agile software development methods. An agile software development team does not deliver a “big-bang system”, but a continuous stream of improvements to a system. In the same way, an agile architect does not deliver a “big up-front design”, but a continuous stream of architectural decisions, step by step gaining control of the uncertainties and risks surrounding complex IT solutions. How much architecture to build in is determined not by agile dogmas like “You Ain’t Gonna Need It” (YAGNI), but by economic trade-offs taking into account the real value of architecture in context. Architects can do much to cross the divide towards agility – in fact, they not only can, but must. If they don’t make this effort, architecture departments will lose touch with their IT development departments, where agile methods have become mainstream, and with their business stakeholders, who continually ask for faster and better responses to changing market requirements. The key change architects need to make is to no longer view architecture as a design document to be delivered to projects up-front, but as a continuous decision making process in order to gain control over cost, risks and uncertainty. Only then can architects deliver the added value and flexibility required from them by their business stakeholders. Listen to Bett and Russ of architecturecast.net interviewing me about these ideas and RCDA. This entry was posted in Idea on 23 July 2013 by admin. Care should be taken to place these rephrased assumptions in an appropriate section of the architecture documentation. Scope limitations and requirement interpretations belong in the Requirements section. Dependencies, pending agreements and decisions usually represent architectural concerns that have not yet been fully addressed, and belong in the Concern Register or equivalent section of the architecture document. Do not forget to document the implications of these. Many assumptions also lead to risks and may require mitigation measures, which should be added to the risk register and project plan. Clarifying what type of assumption we are making leads to more clarity what actions need to be taken to deal with them. It avoids the negative “cover your behind” connotations many experience when reading assumptions, and gives a more pro-active impression of an architect who deals with, rather than avoids uncertainties. What are your experiences with assumptions in architecture documentation? Are there more types of assumptions than the five categories listed above? This entry was posted in Idea on 2 May 2013 by admin. I recently read an interesting book chapter by Barry Boehm about what is the right amount of architecture to do “up-front” before committing to the architecture. 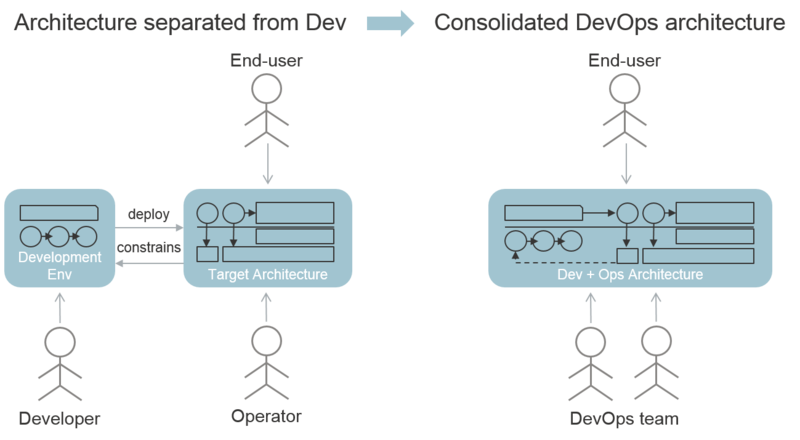 Boehm analyses his project database and concludes that for most solutions, a proper solution architecture validated up-front will eliminate many of the delivery overruns and shortfalls commonly experienced. The only exception is small, non-critical solutions in a volatile environment; in those situations, architecting generally has a negative ROI. My only addition to this table is a translation of Boehm’s Lines of Code to project budget, based on the assumption that the need for architecture in pure software solutions has roughly the same budget relationship as that in IT-related solutions with a wider scope. Boehm also nicely shows that the optimum architecture effort goes down for solutions with a less stable context, and goesup for more business critical solutions. RCDA does not consider architecting to be an “up-front” activity that has to be completed before implementation of the solution can start. In most projects, however, there is a moment that can be identified as the Architecture Milestone. This is the moment after which reversing key architectural decisions becomes very costly and time-consuming, the moment at which the delivery team commits to the architecture. This is a key milestone for solution architects. Solution architects need to know how much architecture needs to be done before this milestone. In RCDA, the answer to the “how much architecture?” question is based on the view of architecting as a risk- and cost management discipline. 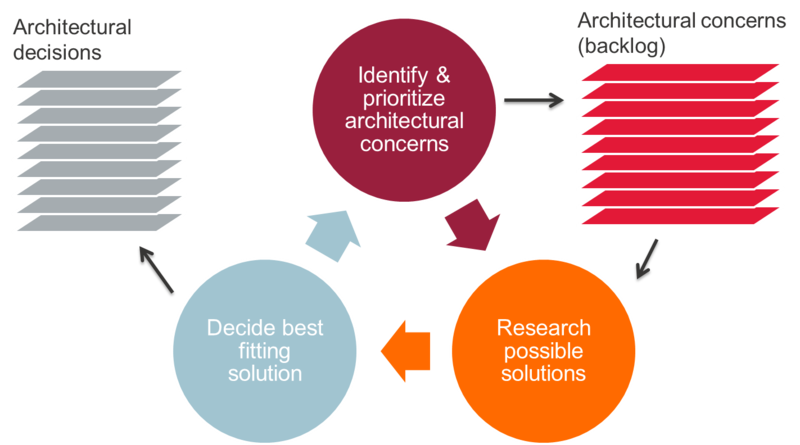 Deciding how much architecture needs to be done before committing to the solution is a risk management decision. A volatile environment increases the probability of overdesign, making less up-front architecting better. A highly business-critical solution increases the impact of not fulfilling architecturally significant requirements, making more up-front architecting better. A large project increases the impact of both rework and idleness, these two risks compete with each other to determine whether more or less up-front architecting is better. When making the trade-off, take into account that the impact of idleness increases linearly with the project size, while the impact of rework generally increases at a superlinear rate, due to the extra coordination and dependencies between the elements of rework. In short, RCDA’s view of architecting as a risk- and cost management discipline leads to the same conclusions as Boehm’s analysis, which adds a nice quantitative heuristic for solution architects to use. “Making Software: What Really Works, and Why WeBelieve It“, edited by Andy Oram and Greg Wilson. Chapter 10: “Architecture: how much and when?”, by Barry Boehm. This entry was posted in Idea on 15 March 2013 by admin.